Cut by Chris @whipsalon Westport. Whip Salon's haircutting expert Chris tells us that he's seeing a trend towards the mod. This modern shag hits all the right notes using a classic style with a modern twist. Super versatile and easy to pull off! Color by Laura @whipsalon Westport. 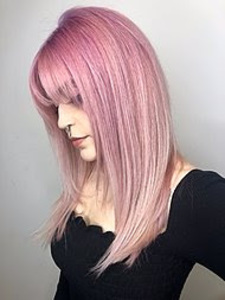 Dusty rose with a lilac root melt is so now. Our clients have been asking more and more for #pulpriot color and we ain't sad about it. Nothing more exciting than getting the color you crave. May take a few sessions to get there, but it'll be soooo worth it! Style by Quinn @whipsalon Westport. Feeling that Bridget Bardot vibe anyone? Just the right amount of teasing on this modern shag. C'est magnifique et tres moderne. Try a little fuller volume for your next blowout at Whip Salon - we're open 7 days. Whip Salon Westport is located at14 Elm Street, Suite 205 or call (203) 433-7334.